Caen had been a D-Day objective. But a month after the invasion the ancient Norman capital remained in German hands. With the arrival of 59 Division in Normandy, Field Marshall Montgomery had just what he needed to renew the attack on Caen by frontal assault. Operation CHARNWOOD called for 59 Division to join 1 Corps at the center of the line between 3rd Canadian Division and 3rd British Division. With all three divisions attacking simultaneously, assisted by massive artillery and naval support fire, the defenders would, in theory, be overwhelmed. In addition to being the first battle for 59 Division, CHARNWOOD saw the first use of carpet bombing in France. The city of Caen was attacked by over 400 bombers on the night of July 7. It was a morale booster for the attackers, but had virtually no impact on the German troop positions north and west of the city. 12th SS Panzer Division (Hitlerjugend) held the center, two and a half miles north and northwest of Caen. Division HQ was located in the Abbaye d'Ardennes. SS Panzer-Grenadier Regiment 25 was dispersed in defensive strongpoints at Authie, Gruchy, Buron, St. Contest, Galmanche, la Bijude, and Epron. Every village and chateau was a fortified position. 12th SS had occupied the area for a month and had plenty of time to prepare strong defensive positions, including a system of trenches southwest of la Bijude. SS Panzer Regiment 12 had 60 tanks available for action on July 7th. About half were in reserve near Ardennes Abbey. The others were dispersed through the front in ambush postions. SS Panzer-Grenadier Regiment 26 was in reserve in the northwestern and southern outskirts of Caen. 16th Luftwaffe Field Division was on the right of the 12th SS, supported by an armoured battalion of 21st Panzer Division. Extending the line westward from Franqueville and Carpiquet was the newly arrived SS Panzer-Grenadier Regiment 1 of the 1st SS Panzer Division (Leibstandarte), attached to 12th SS for this battle. 'H' hour was to be 0420 hours on 8th July. 59 Division was to attack due south against the main enemy defences. 3 Canadian Division and 3 British Division were to attack at the same time, down the ridges on our right and left respectively. At 0420 hours our leading troops crossed the start line. On the right 2/6 South Staffordshire were directed on Galmanche, and on the left 6 North Staffordshire against La Bijude. Our leading companies came under heavy fire within 200 yards of the start line, and though elements of one company entered the outskirts of Galmanche and a few tanks got round the village to the southeast, our attack on this flank came to a full stop. The infantry lost the barrage and remained in the open, suffering heavy casualties from mortar fire as they lay in the standing crops and from machine-gun fire if they tried to move. 6 North Staffordshire gained an initial success, capturing La Bijude by 0730 hours, but both forward company commanders became casualties and a subaltern found himself the senior officer present. He fired the success signal, as both wireless sets had been knocked out. The enemy counterattacked almost at once and drove the two companies back to the area just north of the crossroads between La Bijude and the Chateau de la Londe. Like 2/6 South Staffordshire they continued to suffer casualties from the enemy's defensive fire. At 0620 hours the order reached the battalions concerned that Phase II would start at 0730 hours. This phase involved an attack by 197 Brigade on the right, with two battalions up: 1/7 Royal Warwickshire to capture St Contest and 2/5 Lancashire Fusiliers to capture Malon; and an attack by 176 Brigade on the left with 7 Royal Norfolk to capture Epron. All battalions crossed the start line on time. Records of the action of 197 Brigade are scanty. 1/7 Royal Warwickshire had a long day of confused, hard, fighting with very heavy casualties; but by nightfall they were firmly established on their objective, to the great benefit of the Canadians on their right. 2/5 Lancashire Fusiliers had the misfortune to come under very heavy and accurate fire as soon as they appeared in the open among the standing crops, through which the enemy had cut lanes of fire. This fire came not only from the low ridge directly to their front, but, more serious still, from the trenches south-west of la Bijude. The leading companies lay down in the corn, control was consequently lost and they remained there, suffering heavy casualties from mortar fire, until they were withdrawn in the afternoon. Records of the action of 176 Brigade are fuller. 7 Royal Norfolk crossed the start line unaware of the strength of enemy resistance in la Bijude. Almost immediately they came under heavy fire from that direction, as well as from the high ground to the west of Lebisey on their left. In the smoke and dust of battle our tanks lay too far back from the infantry and the right company lost direction by turning towards the enemy around la Bijude. Both leading companies suffered heavy casualties: in the left company every officer and the sergeant-major were killed or wounded, and the remnants lay down in the standing corn. The right company struggled on until about 1000 hours, but owing to enemy fire no information reached battalion tactical headquarters in its uncomfortable situation near the Chateau de la Londe. The commanding officer therefore launched the "mopping up" company on the right company axis, the tanks firing smoke on its left flank. After heavy casualties a small party eventually joined remnants of the leading company south-east of la Bijude and sent back the first message to reach battalion headquarters giving the situation. This arrived at about 1045 hours. What was left of both companies, all the officers and company sergeant-majors having been killed or wounded in attempts to winkle the enemy out of the hedgerows, eventually withdrew to the chateau area unknown to the commanding officer. The latter, appreciating that the only hope of retrieving the situation lay in the early capture of la Bijude, ordered his reserve company and the tank squadron to prepare to attack it from due north, around the west of the Chateau de la Londe. The plan was approved by the Brigade Commander and timed for about 1400 hours. Meanwhile the remnants of the other three companies were collected by the second-in-command in the chateau area and formed into one composite company of about 50 men. The enemy had taken a frightful hammering, but his resistance was still fanatical and in the trench system south-west of la Bijude, particularly, was still a coherent whole. His positions were giving far too much trouble and had to be eliminated before further progress by the division could be possible. The divisional commander therefore brought 177 Brigade into the battle, 2/6 South Staffordshire reverting to their command. This set 197 Brigade free to concentrate on assisting 1/7 Royal Warwickshire to gain control of St Contest and on extricating 2/5 Lancashire Fusiliers from their exposed situation. To back 1/7 Royal Warwickshire, 5 East Lancashire took up a position west of Galmanche. 177 Brigade sent one company of 5 South Staffordshire to help the 2/6th in Galmanche. Later in the day the 2/6th were withdrawn to Anisy and 5 South Staffordshire took their place, being relieved in their firm base at Le Mesnil by a squadron of 59 Reconnaissance Regiment. By evening almost the whole of Galmanche was in our hands, but the enemy in the chateau were still holding out, and a well-supported company attack by 5 South Staffordshire just before nightfall failed to dislodge them. 1/6 South Staffordshire remained in the position which they had held at Cambes all day, dealing faithfully with the snipers who had remained to harass our transport in that thick country. On 176 Brigade front the attack on la Bijude by 7 Royal Norfolk went in, with tank support, at 1400 hours. After over an hour's hard fighting this effectively cleared la Bijude itself and the attacking company was established, with anti-tank guns, on the southern outskirts of the village. But the battalion had suffered severely and was not in a fit state to go on to capture its original objective, Epron, unaided. During the afternoon brigade headquarters, owing to an error in the use of code-names by the tanks, got the impression that our tanks were in Epron. This was far from being the case. On learning the facts the Brigade Commander placed one company of 7 South Staffordshire under command of 7 Royal Norfolk and ordered the latter to capture Epron by nightfall at all costs. He ordered 7 South Staffordshire, less this company, to capture the trench system west of la Bijude at the same time. Both attacks went in at 2030 hours, with artillery and tank support. On the right the tanks suffered severely in the open country from the fire of well-sited "eighty-eights" and had to withdraw; and there was insufficient weight of artillery to have much effect on the well-entrenched enemy. So 7 South Staffordshire had to fight their way through the maze of trenches with their own weapons. They did this to some purpose and advanced well westwards of the railway. But night found them too disorganised to hold on in the foremost positions gained and they had to withdraw once more behind it. On the left things went better. Supporting fire from the tanks was most effective; by 2200 hours 'A' Company 7 South Staffordshire and 'D' Company 7 Royal Norfolk had cleared Epron and the latter company had moved on to capture and consolidate the key area of Auberge, a small farm on the rising ground south of Epron. 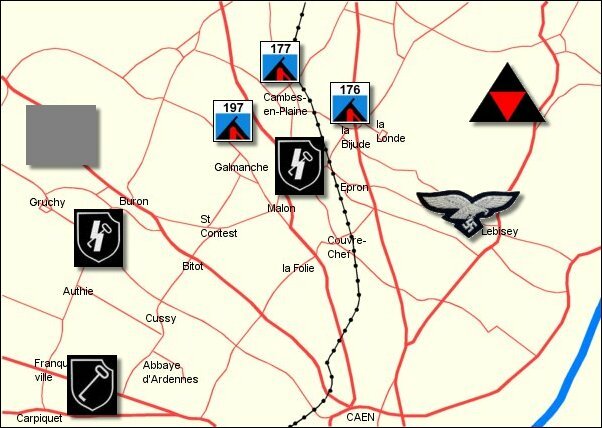 On our right and left 3 Canadian Division and 3 British Division had taken advantage of the enemy's preoccupation with our attacks to advance right into the outskirts of Caen. By nightfall the Battle of Caen had really been won, though the town itself remained to be occupied. The next morning, however, found 59 Division with plenty of enemy resistance still to be dealt with, largely owing to the tenacity of the men of 12 SS Panzer Division. On the right 1/7 Royal Warwickshire were relieved in St Contest by 2/5 Lancashire Fusiliers and occupied Bitot, and by 1730 hours 5 East Lancashire had occupied la Folie. In the centre 5 South Staffordshire put in a company attack against the chateau at Galmanche, supported by tanks and armoured vehicles of the Royal Engineers. On 176 Brigade's front 6 North Staffordshire put in a full scale attack at 0930 hours for the final clearance of the trench system west of la Bijude. It was not till 1300 hours that the remaining resistance was finally subdued, and the battalion occupied Malon. 7 Royal Norfolk sent 'A' Company 7 South Staffordshire to occupy Couvre-Chef, remaining in occupation of Epron and Auberge themselves. Auberge was subjected to a lively attack by the 75mm guns of tanks supporting 3 British Division, luckily without casualties.